The Neapolitan people, considered one of the most romantic of all, is distinguished by a particular emphasis on Valentine’s Day, the feast of all lovers and recognized for centuries as the day dedicated to love. Homage and testimony on this day where young people of all ages renew their love with new promises and exchanging gifts. It is a tradition now consolidated, that in recurrences like this, the boys give their girlfriend “the heart-shaped box” to give a special good morning, so almost by magic the lover is surprised because in addition to a full-bodied breakfast can find the gift of their dreams, or perhaps the discovery of having an unknown admirer who thus finds the courage to declare their feelings. The box in general contains mostly a breakfast, containing a drink (a cappuccino, a coffee, an orange juice or a fruit juice) accompanied by a sweet (usually a croissant ) maybe even a soft toy . However, the Perugina® Baci are inevitable and they become the icon of the most romantic party of the year. It is not a simple breakfast but a real sensory experience: in addition to taste, the sense of smell also takes part in this tender moment, a red rose the most classic symbol of love and passion. Touch and sight are present because the first is manifested when one embraces the teddy bear symbol of tenderness and the second when one reads the poetry of love. And will your hearing ask you? Also the hearing is involved because in fact the breakfast follows the due phone call to the boyfriend for thanks. 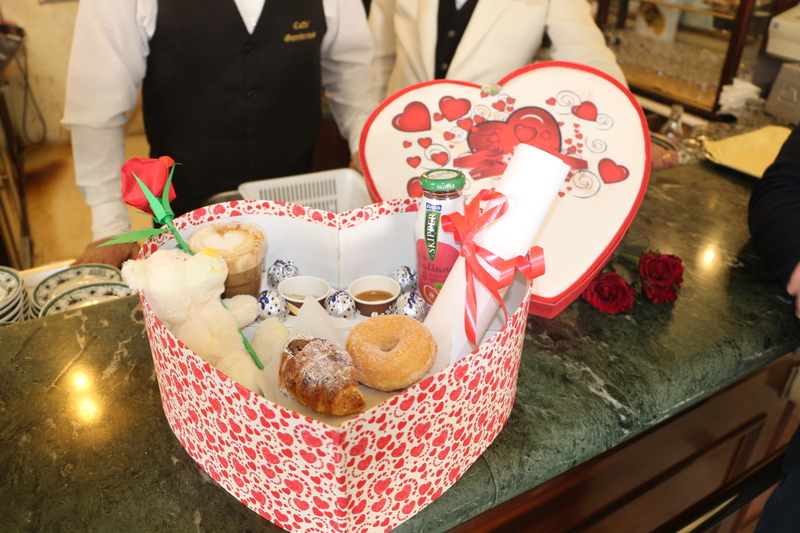 A new tradition has consolidated and now we can say that can not start the Valentine’s day without waking up with a good coffee or cappuccino.